What is Industry 4.0—the Industrial Internet of Things (IIoT)? Industry 4.0 refers to a new phase in the Industrial Revolution that focuses heavily on interconnectivity, automation, machine learning, and real-time data. It includes cyber-physical systems, the Internet of things, cloud computing and cognitive computing. Industry 4.0 is commonly referred to as the fourth industrial revolution. Industry 4.0, also sometimes referred to as IIoT or smart manufacturing, marries physical production and operations with smart digital technology, machine learning, and big data to create a more holistic and better connected ecosystem for companies that focus on manufacturing and supply chain management. While every company and organization operating today is different, they all face a common challenge—the need for connectedness and access to real-time insights across processes, partners, products, and people. Before digging too much deeper into the what, why, and how of Industry 4.0, it’s beneficial to first understand how exactly manufacturing has evolved since the 1800s. There are four distinct industrial revolutions that the world either has experienced or continues to experience today. The first industrial revolution happened between the late 1700s and early 1800s. During this period of time, manufacturing evolved from focusing on manual labor performed by people and aided by work animals to a more optimized form of labor performed by people through the use of water and steam-powered engines and other types of machine tools. In the early part of the 20th century, the world entered a second industrial revolution with the introduction of steel and use of electricity in factories. The introduction of electricity enabled manufacturers to increase efficiency and helped make factory machinery more mobile. It was during this phase that mass production concepts like the assembly line were introduced as a way to boost productivity. Starting in the late 1950s, a third industrial revolution slowly began to emerge, as manufacturers began incorporating more electronic—and eventually computer—technology into their factories. During this period, manufacturers began experiencing a shift that put less emphasis on analog and mechanical technology and more on digital technology and automation software. In the past few decades, a fourth industrial revolution has emerged, known as Industry 4.0. 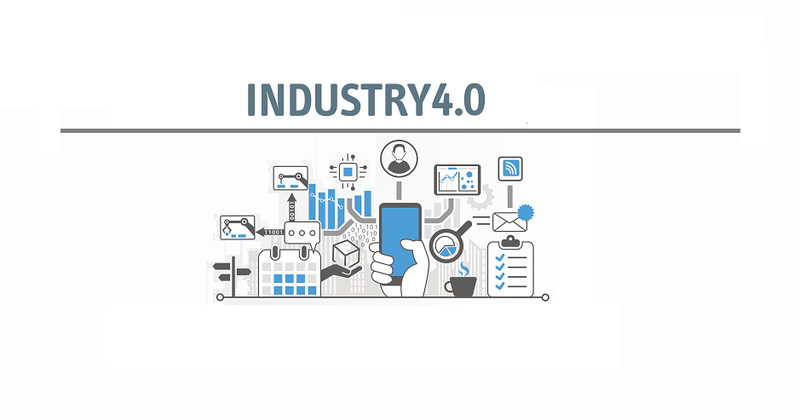 Industry 4.0 takes the emphasis on digital technology from recent decades to a whole new level with the help of interconnectivity through the Internet of Things (IoT), access to real-time data, and the introduction of cyber-physical systems. Industry 4.0 offers a more comprehensive, interlinked, and holistic approach to manufacturing. It connects physical with digital, and allows for better collaboration and access across departments, partners, vendors, product, and people. Industry 4.0 empowers business owners to better control and understand every aspect of their operation, and allows them to leverage instant data to boost productivity, improve processes, and drive growth. IoT: IoT stands for Internet of Things, a concept that refers to connections between physical objects like sensors or machines and the Internet. IIoT: IIoT stands for the Industrial Internet of Things, a concept that refers to the connections between people, data, and machines as they relate to manufacturing. Big data: Big data refers to large sets of structured or unstructured data that can be compiled, stored, organized, and analyzed to reveal patterns, trends, associations, and opportunities. Artificial intelligence (AI): Artificial intelligence is a concept that refers to a computer’s ability to perform tasks and make decisions that would historically require some level of human intelligence. M2M: This stands for machine-to-machine, and refers to the communication that happens between two separate machines through wireless or wired networks. Digitization: Digitization refers to the process of collecting and converting different types of information into a digital format. Smart factory: A smart factory is one that invests in and leverages Industry 4.0 technology, solutions, and approaches. Machine learning: Machine learning refers to the ability that computers have to learn and improve on their own through artificial intelligence—without being explicitly told or programmed to do so. Cloud computing: Cloud computing refers to the practice of using interconnected remote servers hosted on the Internet to store, manage, and process information. Real-time data processing: Real-time data processing refers to the abilities of computer systems and machines to continuously and automatically process data and provide real-time or near-time outputs and insights. Ecosystem: An ecosystem, in terms of manufacturing, refers to the potential connectedness of your entire operation—inventory and planning, financials, customer relationships, supply chain management, and manufacturing execution. Cyber-physical systems (CPS): Cyber-physical systems, also sometimes known as cyber manufacturing, refers to an Industry 4.0-enabled manufacturing environment that offers real-time data collection, analysis, and transparency across every aspect of a manufacturing operation. Industry 4.0 spans the entire product life cycle and supply chain— design, sales, inventory, scheduling, quality, engineering, and customer and field service. Everyone shares informed, up-to-date, relevant views of production and business processes—and much richer and more timely analytics. It makes you more competitive, especially against disruptors like Amazon. As companies like Amazon continue to optimize logistics and supply chain management, you need to be investing in technology and solutions that help you improve and optimize your own operation. To stay competitive, you have to have the systems and processes in place to allow you to provide the same level of service (or better) to your customers and clients that they could be getting from a company like Amazon. It makes you more attractive to the younger workforce. Companies that invest in modern, innovative Industry 4.0 technologies are better positioned to attract and retain new workers. It makes your team stronger and more collaborative. Companies that invest in Industry 4.0 solutions can increase efficiency, boost collaboration between departments, enable predictive and prescriptive analytics, and allow people including operators, managers, and executives to more fully leverage real-time data and intelligence to make better decisions while managing their day-to-day responsibilities. It allows you to address potential issues before they become big problems. Predictive analytics, real-time data, internet-connected machinery, and automation can all help you be more proactive when it comes to addressing and solving potential maintenance and supply chain management issues. It allows you to trim costs, boost profits, and fuel growth. Industry 4.0 technology helps you manage and optimize all aspects of your manufacturing processes and supply chain. It gives you access to the real-time data and insights you need to make smarter, faster decisions about your business, which can ultimately boost the efficiency and profitability of your entire operation.